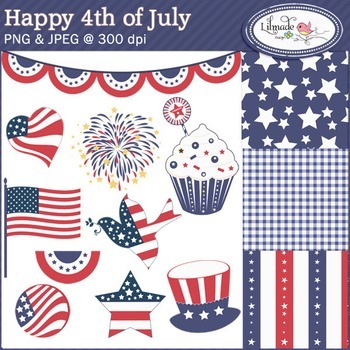 Happy 4th of July clip arts and digital papers set includes three 4th of July digital papers plus an assortment of festive 4th of July inspired clip art elements including a pennant banner, one heart shaped US flag clip art, one classic US flag clip art, a dove shaped US flag, a star, a 4th of July cupcake decorated with a cupcake topper, a fun 4th of July hat, and of course fireworks! The papers: come in JPEG files at 300 dpi. Size 12 x 12 inches. The clip arts: come in PNG and JPEG files at 300 dpi. Each clip art measures about 6 inches at the widest or tallest point. Commercial use license for small scale. If you use our artwork to produce more than 1000 items you will need an extended license. >> You may use this digital set to create create lesson plans you will sell in TPT type of website, as long as you add a fair amount of work and our graphics are integrated into your design. Please secure your PDF files so that our graphics cannot be extracted and please give credit to Lilmade Designs inside your PDF. >> Other allowed uses: you may also use our graphics to create decorations to use in your classroom or you to sell in printed form, printed party decorations you will sell for personal use, tangible items such as jewelry you will sell in small scale, digital printables personalized for a particular customer, designs for your print on demand store such as business cards, invites, mugs, ornaments and digitized embroidery designs. >> Not to be resold as is. Must be modified e integrated into your design.